After taking a few months break from image processing I decided to jump back into this past weekend. Since the weather in Seattle isn’t exactly perfect for imaging in February, this latest image was produced from data which I captured September – October, 2012. 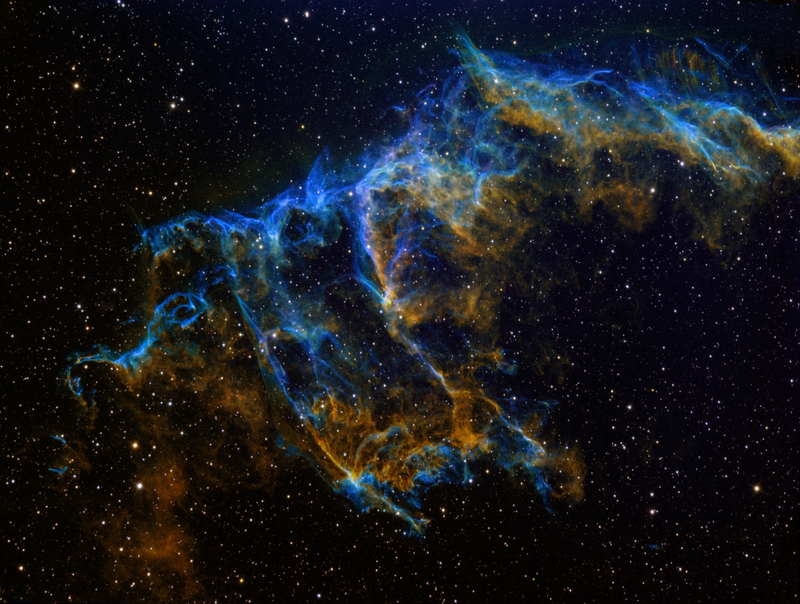 This particular object is called NGC 6992, otherwise known as the Eastern Veil nebula. This is my first attempt to capture the veil nebula. It’s quite a large structure, so it isn’t possible to capture the entire object with my scope. The good news is that many sections of the nebula are fantastic and beautiful just on their own, and I do plan to image these other parts of the nebula in 2013. From an image processing standpoint, I have been wanting to make some progress with coming up with better imaging sharpening techniques for quite some time now. Most techniques I’ve tried so far produce halos around stars, and many add a sort of blotchy noise to the resulting image. I have been trying to find something better. After some searching I ran across “Fat Tail” Richardson-Lucy Deconvolution and decided to give it a try. After spending some time learning how to adjust this new tool, I think the results were pretty good. Over 28 hours of starlight exposures went into this project.